I love the composition on this one – the roof is really sharp against the dark green in the trees. 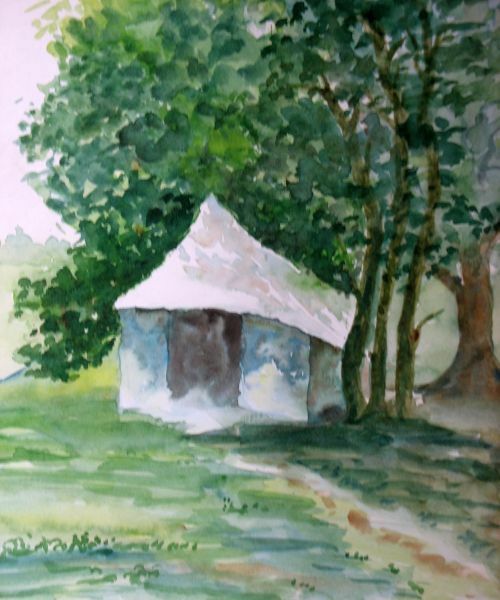 You’re doing great in watercolor – I tend to cheat and use ink lines, but I’m now struggling with technique in one of Kate Johnson’s classes. This is my second try at a comment – please erase it if a duplicate. I love the contrast of the white roof sharply outlined against the dark green in the leaves – the composition works brilliantly. You’re off to a really good start – I’m also struggling with watercolor technique right now – taking on of Kate Johnson’s classes. I’ll be following your progress here, but so far, so good! Thanks for your comments. What you call cheating is indeed a technique, and you are good at it. I love the line and wash method, though for now I think I should practise more only with wash. For this remains the foremost challenge, for time and again whatever little progress I seem to make is undone by the next attempt. Till I get comfortable to the extent that it becomes ‘effortless’, that is if I can do it as much as I write with pen with ease… that is my goal. Oh, that’s a long way to go, may be! In all your works, I can see you have got a great feel for the wash, for the medium, I am sure with this solid foundation you will go very far. All the best for your classes. By the way I have benefitted a great deal from the live demonstrations at thepaintinganddrawingchannel.com where professional artists give instructions. Wonderful they are, you may give it a try. Just take a look.